You may notice there is no pet in this picture of the Menorrah. Our furry friends should not be near lit candles or open flames. Keeping your pet safe during Hanukkah will help to ensure that all family members enjoy the holiday, including the four-footed ones. 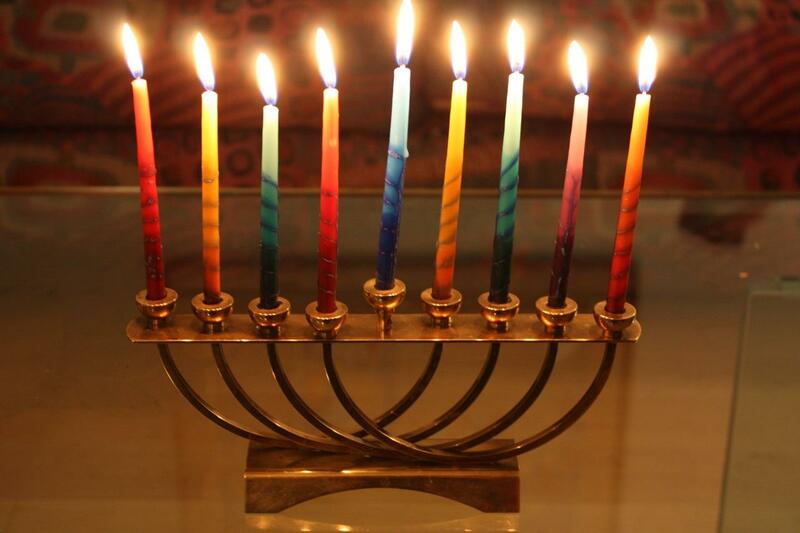 The Jewish observance of Hanukkah begins tomorrow at sunset. For thousands of years, this Festival of Lights has been celebrated with eight nights of tradition, gift-giving and special foods. It’s a happy time with family and friends, so you may want to include your pet in the fun. As with other celebrations, it’s important to keep your pet’s health and safety in mind. The Menorah with nine candles is a classic symbol of Hanukkah. The celebration begins as blessings are recited and the candles are lit. But burning candles can be a hazard if a curious pet or a wagging tail gets too close. Make sure your furry friend does not have access to the Menorah if you are using real candles. Hanukkah gelt is a gift of money, or frequently foil-wrapped chocolate coins. The kids love the chocolate, which we all know is harmful to pets, thanks to the theobromine and caffeine it contains. But the shiny foil wrapper can also cause digestive problems if eaten, so keep the candy away from your furry buddies and take care to dispose of the wrappers where your four-footed family member won’t be tempted. Classic Hanukkah food includes latkes and small sugared donuts. Latkes are pancakes made with shredded potatoes and onions, and fried nice and crispy. Like the donuts, they’re yummy - and high in fat, which can cause gastrointestinal problems for your pet. But the greatest danger comes from the onions in the latkes. Onions contain thiosulphate which is toxic to dogs and cats. Even cooked, a small amount of onion could poison your best friend. Sharing traditions and celebrations like Hanukkah with all family members, including the four-footed ones, can make them even more special. Find some healthy treats to give your pet while you enjoy the Hanukkah donuts, latkes and chocolate Gelt. That will help to ensure that you both will be able to share in the blessings and enjoy all the holidays and celebrations throughout the year, when you’re speaking of pets.